Zapovednik Kavkazsky, in Stavropolsky and Krasnodarsky krais (regions), was founded in 1954. Its area is 282,5 thousand ha. It consists of two sites: the main mountain site and a part of a box-yew area on the Black Sea shore (301 ha). It is located in the western part of Main Caucasus ridge and includes a range of mountain landscapes from low-mountain to high-mountain. The highest absolute mark is 3346 m above sea level. Mountain tops are covered with snow and glaciers, avalanches are frequent. 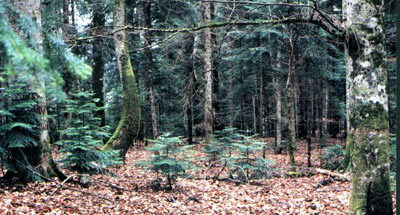 About 60% of the territory is occupied by forest. In the lower height belt broad-leaved and oak forests with an additional mixture of hornbeam, Caucasus pear, cherry plum and other bushes are spread. The box-yew grove is interesting, being formed from relict plants of the tertiary period — common yew and Buxus colchica (included in the Red Data Book of Russian Federation). Several yew trees are more than 1500 years old and reach 20-55 m high; box trees reach 10 m at the age of 400 years. In the height range of 500-1500 m beech forests prevail, at 1000-1800 m — fir forests, spruce-fir and spruce forests grow. The upper forest border (2000-2300 m) is formed of birch and maple-beech crooked forest, exchanging with pine forests. 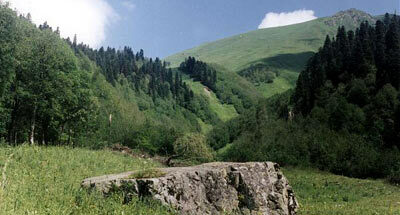 Alpestrine belt (1800-2400 m) is presented by thickets of Caucasus rhododendron and picturesque tall-grass meadows. Up to 2800 m the alpine belt is spread with meadow-heathland low-grass, areas of carpet plantations and groups of plants on rocks and bare eroding slopes. The subnival belt (2700-3000 m) is presented by lichen communities with separate flowering plants. Higher than 3000 m the nival belt begins. Flora makes up more than 1500 vascular plant species, including 130 trees and bushes. 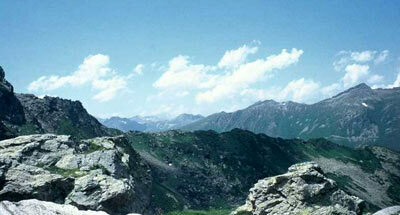 Flora includes many endemic species of the Caucasus (Euphorbia macroceras, Quercus iberica, Eunymus leiophloea, etc. ), and relict species (Nordmann's fir, Caucasus syringa, Laurocerasus officinalis, etc.). 32 plant species are in the rare or disappearing category, and included in the Red Data Book of the Russian Federation; in particular — European hop hornbeam, Staphylea colchica, Cyclamen coum subsp. caucasicum, etc. There are noted more than 60 mammil species. In the Park there live American elk, European roe, wild boar, chamois; auroch is numerous, bison has become re-acclimatized. Brown bear, Felis silvestris, lynx, common and stone marten; badger, and wolf also are to be found in the Park. Extremely rare leopard possibly enters the Park sometimes. There are many birds; of rare species the Caucasus black grouse is characteristic; the bearded vulture, golden eagle, griffon vulture, and fish hawk nest. Of rare snakes both Aesculapian snakes and the Caucasus asp are notable; of rare amphibian species the Mediterranean turtle, and the banded newt. More then 20 vertebrate species living in the Zapovednik are in the Red Data Book of the Russian Federation. 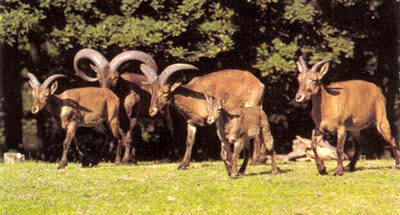 Rare insects are numerous (such as the alpine Capricorn beetle, Caucasus swift moth, common stag beetle, etc.). The Park has biosphere Zapovednik status.